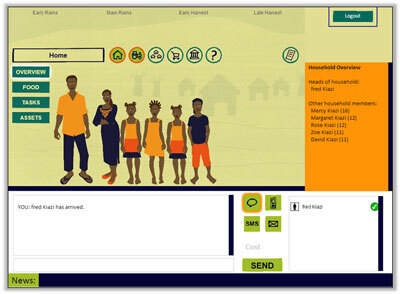 Your challenge is to manage a farming household in a small village. You need to make decisions on what crops to grow, when to plant them and respond to crop pests and changeable weather. You must manage labour and provide your family with a nutritious diet or they may become ill and be unable to work. The game is available in two versions: a single player game and a multiplayer game. Dr John Thompson (Future Agricultures/Institute of Development Studies) is the Project Co-ordinator. The multiplayer game was developed by a team from the University of Sussex and Future Agricultures. Ellie Martin and James Jackson developed the game at the School of Engineering and Informatics, University of Sussex, under the leadership of Dr Judith Good. The single player game is developed by James Jackson. African Farmer develops ideas from the educational board games Green Revolution, developed in the 1970s by Graham Chapman and Liz Dowler and Africulture, developed in the 1980s by Graham Chapman, Janice Jiggins and Henk de Zeeuw. Both versions of the game are free to download and any required software is also freely available. The multiplayer game client runs in any web browser with the Adobe Flash Player plugin. The game server is written in Java and uses SmartFoxServer, the Hibernate library and MySQL. The multiplayer game is licensed under the GPL License (GPL) and can be downloaded from GitHub. Java is covered by open source and Oracle licenses and is free to download and use. The SmartfoxServer 2X Community Edition license provides full-featured support for up to 100 concurrent users at no cost. Hibernate and MySQL software is freely available under the GPL License. Flash Player and Adobe AIR is proprietary software from Adobe that are free to download and use.